CAMAS — Area artists, businesswomen and friends Liz Pike and Sarah Bang are joining forces for a two-day art show on Saturday and Sunday, July 7 and 8 from noon to 6 p.m. each day. 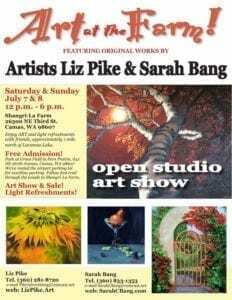 The fifth annual Art at the Farm event will showcase each of their original styles in oils and acrylics in an open air event at Liz Pike’s Shangri-La Farm, located at 26300 NE Third Street, in Camas. Area artists, businesswomen and friends Liz Pike and Sarah Bang are joining forces for a two-day art show on Saturday and Sunday, July 7 and 8 from noon to 6 p.m. each day. Those who attend will have the opportunity to enjoy live painting demonstrations by the artists. The public is welcome to attend and enjoy original works of art on display for show and sale. There is no cost to attend. Light appetizers and refreshments will be served. Those arriving for the show can park at the rented Grove Field Airport parking lot, 632 NE 267th, Camas, just around the corner from Shangri-La Farm. A short trail through the woods meanders to the farm. ADA parking is available directly at the Farm. Pike owned and operated the Pike Art Gallery in Camas until 2008. She is the founder of Camas First Friday Art Walk and has been painting in oils on canvas since 1984. Her work has been featured in art galleries in Honolulu, Vancouver and Camas. Bang’s art has been featured on CD covers for Michael Allen Harrison, wine labels for Northwest wineries, and the cover of Country Pleasures magazine. Her artwork has also helped raise more than $75,000 for Children’s Miracle Network Hospitals. Their work can also be found online at LizPike.Art and SarahCBang.com. For more details, call Liz Pike at (360) 281-8720.